We've been having a spot of bother with drunks of late at the Town Crier, which is the pub where our Wednesday night knitting group meets up. The past few weeks, we've drawn unwanted attention of one kind or another, almost as if the boozy-er patrons think we're some sort of entertainment the management have laid on. Last night we had a couple of potential new members to the group and I hate to think what they thought... And of course, dealing with drunks is not exactly something any of us are keen on, most of us being quiet types at heart. This is a recent development and an unwelcome one. I mean, sure, we've had the odd encounter with the tipsy - we are in a pub after all - but they used to be few and far between, now it's beginning to feel like a regular thing. All of this means it may be time to move again. If we did decide against using a pub again, what are our options? Where can a group of knitters gather of a midweek evening and not be harassed? Our requirements are simple enough, we need light, minimal stairs, toilet facilities and refreshments should be available... Time to put on the thinking cap methinks. Moving swiftly on, a finished object that I would have posted about last week had I not been locked in a classroom without internet access. 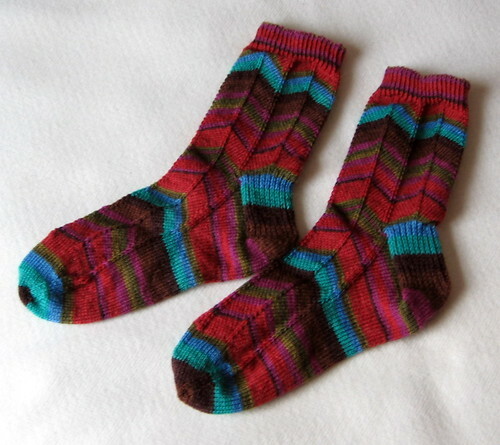 These are my finished Jaywalker Socks (Ravelry Link), designed by Grumperina and knitted in Regia Design Line Kaffe Fassett (colourway 04259). I'm very pleased with the way they finally turned out, but it was a long, hard road getting there. After reading dire warnings about problems with fit on Ravelry, I swatched for this pair of socks before starting. The pattern calls for 2.25mm needles, but I used 2.5mm to meet the stitch guage. The first sock I knitted was far too big at the cuff and so, it was ripped out and I started again. This time I knit the cuff on 2.25mm needles, using a K1b,P1 rib rather than a K2,P2 rib as specified by the pattern. I switched to a 2.5mm needle for the main body of the sock. My hope was that the smaller needles and the K1b,P1 rib would pull the cuff in a bit so it clung to my calf the way it was supposed to. As you can see here, it worked a little at least. What you can't see is that I pulled the rib up just before the photo was taken which is why it's sitting right. Having worn these socks, I can attest to the fact that the rib doesn't stay like that. It falls down... Fortunately, the main pattern itself is clingy and keeps the sock up - meaning that you don't actually need a rib on the cuff and that it's purely decorative rather than functional. 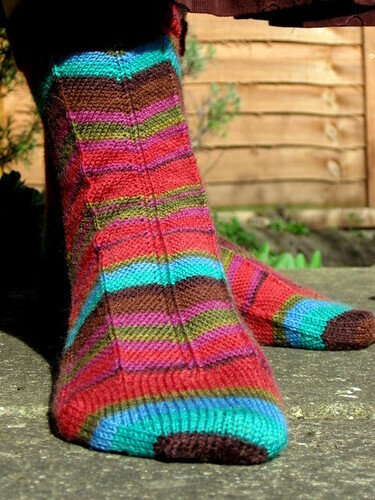 If I make these socks again, I'll drop the ribbing from the cuff, other than maybe a few rows just to get the edge stabalised and past that wrestling with a hedgehog stage common to casting on with DPNs. The rest of the fit wasn't great either. I didn't have problems with the heel being too tight (something which seemed to be an issue for others) and there is no problem putting the sock on. 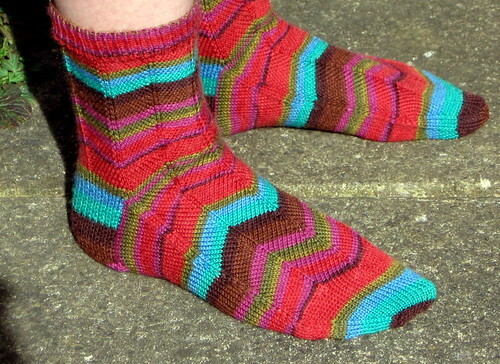 If anything, I'd say the heel flap is marginally too long, but not enough to make the sock unwearable. The other worry was that I'd run out of yarn. Due to the chevron pattern, you need a good few more stitches per inch than normal which means that the yarn has to travel further to complete each round. This in turn meant that the sock was eating yarn at a prodigious rate and was the other reason I ripped out that first sock... At the rate it was going, I couldn't guarantee I'd have enough yarn for the pair. My second run through, I shortened the leg of the sock by two inches to compensate and finished each sock well within 50g of yarn. I also reworked the numbers for turning the heel as the numbers didn't work for me, but that was pretty elementary stuff, so all good there. In all, it's a very pretty sock, I love the chevron affect and I particularly love how it worked out with this yarn/colourway. It's not one I'd say never again to, but I may need a few months recovery before I'd be happy to give it another go. I do like the socks they turned out well. Around us free venues don't exist other pubs, and landlords don't want a quiet pub. For a small fee, places are plentiful from leisure centres to church rooms. Do have any late night cafe or library's that would let you in. Love the socks! Library could be a good bet, quiet a few are looking at other ways to get people into them at the moment, Sally Army usually have rooms for use, though you may have to rent, I reckon a cafe is a good bet, I'm sure you should be able to get a local one to stay open late, if you promise one night of good coffee drinking and cake eating! good luck with finding somewhere.